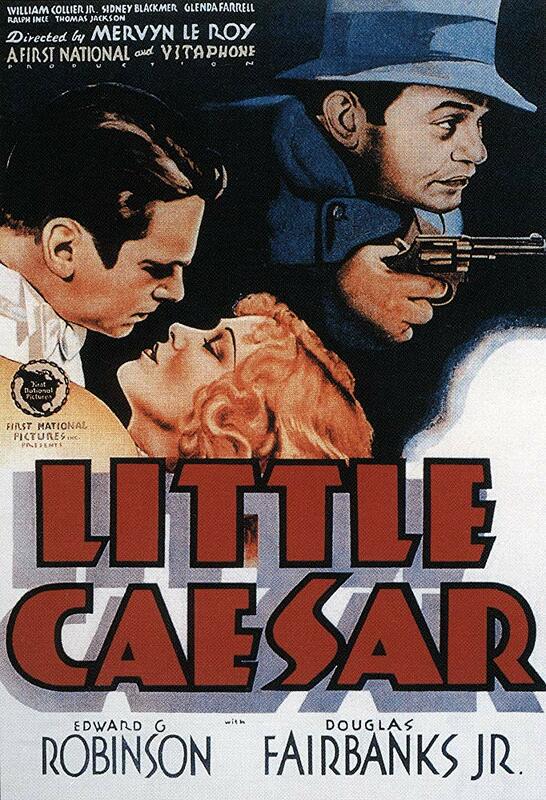 A small-time hood named Rico (Edward G. Robinson) rises to prominence as a gangster, but is frustrated when his best friend (Douglas Fairbanks, Jr.) chooses a life with his new dancing partner (Glenda Farrell) over crime. 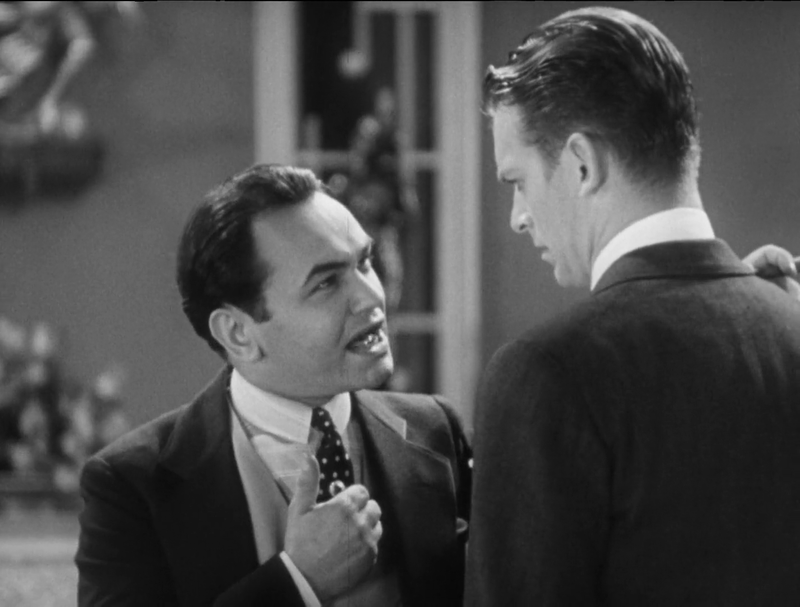 Peary elaborates on his praise for Robinson’s performance in Alternate Oscars, where he names Robinson Best Actor of the Year and notes, “Robinson is frightening as the swaggering, power-hungry Rico, not a character anyone would want to emulate. When he’s just a henchman, he scowls constantly, looks at everyone with sideways glances under a pulled-down hat, and is always snarling, talking back, or arguing… He uses his thumb when he talks, intimidatingly pointing it at others or thumping his chest like a dictator. Only when he becomes powerful is he cheerful, admiring himself in the mirror, getting his picture taken, combing his hair, having a banquet thrown in his honor, smoking cigars, wearing the outfit and pinky ring that a gangster he envied once wore.” However, when “Rico tumbles back to the gutter, he becomes a grotesque, primitive, slovenly figure.” Indeed Rico could be viewed as pure “id” — his character isn’t nuanced, but rather simply representative of Desire for Power. Fairbanks, Jr.’s role offers audiences an opportunity to see someone more human and humane, grappling with loyalty versus future goals; he’s fine in his supporting role, as is gutsy Farrell. Yes, for its historical relevance and Robinson’s performance. A once-must, for Robinson’s performance. Watching this film again after many years, it’s a bit jarring how much it creaks. Time has not been all that kind to it. Partially that’s due to how director LeRoy has paced the film; it has an uneven tone at times and can be a little sluggish – when a film this short (78 minutes) would benefit more from a plow-through. 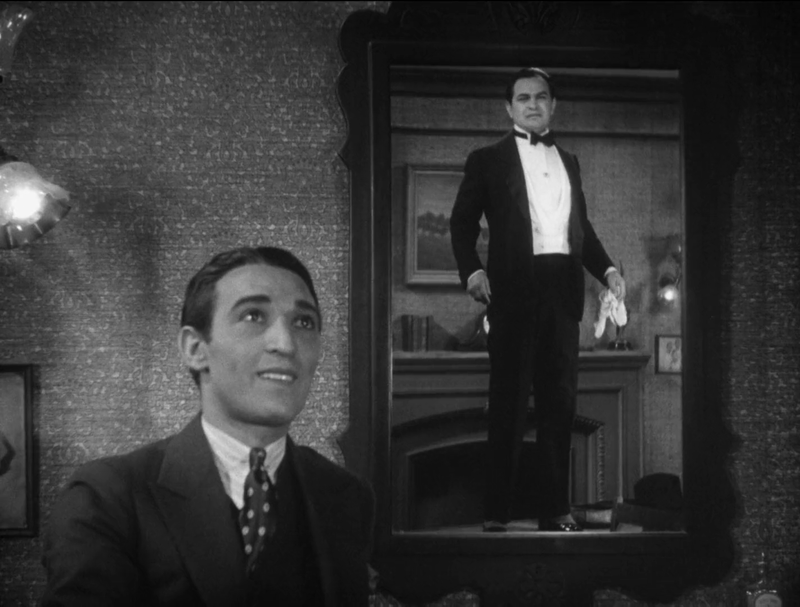 Some may say there’s not enough hard evidence that Rico is gay (and certainly, in 1931, that would have been a risky element to make clear on-screen) but there’s certainly evidence that he’s in some kind of denial. When Fairbanks Jr. (Joe) tells Robinson he’s in love with Olga (Farrell), Robinson’s tone tells us he’s clearly anti-women (“Love! Soft stuff!”). It’s not so much that Rico is against Joe’s preferred profession (as a dancer) but he belittles that when Joe no longer wants a main life of crime (“… and I kind of took pride in you, Joe. …but now you’re gettin’ to be a sissy.”). Rico would be the type of homosexual who hates men who aren’t masculine-enough for him. It’s also easy to imagine that Rico likes the fact that Joe is heterosexual; he doesn’t care that Joe likes women… as long as no woman is a threat to Joe’s standing with Rico. The acting on the part of most of the rest of the cast falls more into the generic ‘tough guys and cops’ variety, though (as the main cop, Flaherty) Thomas Jackson has a nice, blasé quality. Fairbanks Jr. does some fine work as Joe, but I’m less impressed with Farrell’s Olga – her performance seems all surface without nuance of any kind (but I also don’t think it’s a well-written role). Of note as well is Sidney Blackmer. Blackmer is quietly chilling in his one scene with Robinson as ‘Big Boy’.